The Ford Falcon car was made from 1960 to 1970. Over the years, it was available in several sizes and shapes that included four and two door sedans, station wagons, convertibles, Rancheros and sedan deliveries. 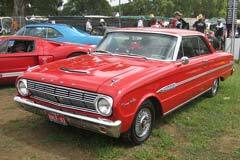 The original Ford Falcon body was built so it was big enough to seat six and have good fuel economy. The first models only had basic features with limited colors. They only had six cylinder engines with a 2 speed automatic or 3 speed manual transmissions. In 1961, a newer, more powerful, six cylinder engine was available as an option. In 1962, the Sprint and Futura models were introduced and they had bucket seats and deluxe interior trim. By 1963, Ford introduced two major improvements, a V-8 engine and a convertible option. From 1964 through 1965 models had a new finned body style, along with a 289 horsepower V-8 engine. The 1966 to 1967 models were larger with a new design. The 1968 to 1969 Falcons had slight body changes. In 1970, the Falcons started using the Torino body frame. They were referred to as "1970 ½ Falcons" and this was the final year that Ford Falcons were made. 1963 Falcon -FUTURA-Blue Angel 1963 Ford Falcon for sale! 1963 Falcon Futura Convertible CLEAN AND DOCUMENTED FALCON, GR8 COLORS, SMOOTH RUNNING 170 CI INLINE 6, AUTO! !